The devastation after a tornado is horrific. Looks like Hiroshima. Lives are lost, livelihoods are lost, places to live are lost. But within hours neighbors, police, firefighters, the Red Cross, and Operation BBQ Relief (OBR) are on the scene to help. 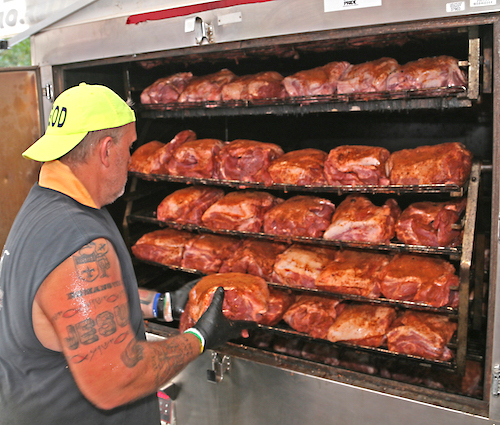 OBR is a 501(c)(3) charity and it has a list of Competition BBQ teams who have big rigs, mobile kitchens, and pitmasters who can hop in their cars and be on the road in a hurry, and they even have a small fleet of mobile kitchens they own. When disaster hits, the emails go out and pitmasters rally to the call. AmazingRibs.com has been a major supporter of OBR for years and donates 5% of the membership fees from the Pitmaster Club to OBR. If you are not already a member of our Pitmaster Club, click here for more info and to join. In 2017 we sent our Rick Browne to Houston for a week to cover OBR at work after Hurricane Harvey. Here is his report. On August 26, 2017, Hurricane Harvey hit Houston hard with winds of 130 mph and up to 52 inches of rain, overflowing the bayous, reservoirs, lakes, and rivers. Among the relief groups mobilized was Operation Barbecue Relief (OBR), a relatively unsung team of barbecue pitmasters who made an immense impression by serving more than 371,000 delicious hot meals to the victims and first responders in just two weeks. They were distributed all over the countryside by car, truck, boat, and even by air. 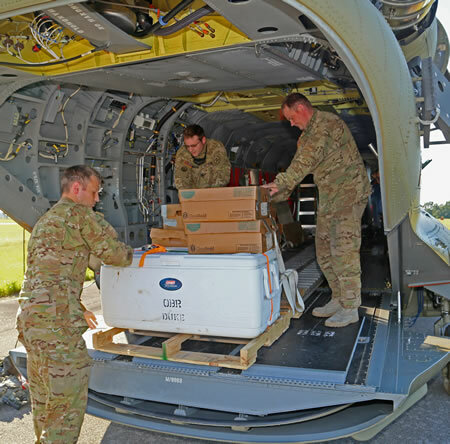 Beaumont and Silsbee were virtually isolated and surrounded by floodwaters so OBR flew thousands of meals in helicopters provided by the National Guard and the US Customs and Border Patrol. Then, only 15 days later, on September 10, Hurricane Irma started its stroll through Florida. Within days the OBR team had re-deployed from Houston to not-so-sunshiny state. 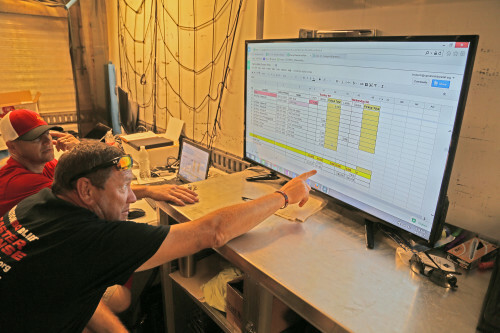 Partnering with FedEx, they were even shipping meals by plane to isolated Key West. By the time they packed up and headed home they had served more than 126,000 meals in Florida. 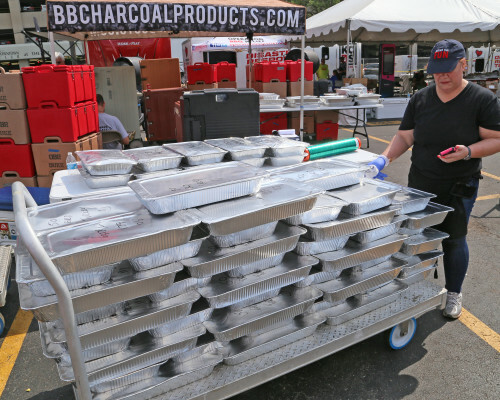 Here is the story of this remarkable team of BBQ pitmasters and how they served almost half a million badly needed hot meals in the aftermath the twin hurricanes of 2017. “When people have lost everything they have to lose, we give everything we have to give” says Hays. 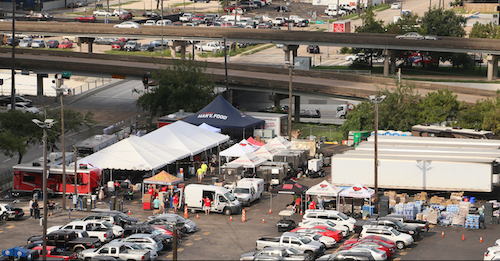 With the rains still coming down in Houston, OBR began setting up an outdoor kitchen (left) in a dry parking lot, two blocks from the shelter in the George R. Brown Convention Center, smack in the middle of downtown Houston. They quickly pitched tents, unfolded prep tables, fired up large barbecue pits, and began unloading truckloads of meat, bread, and vegetables. On the first day the team prepped, cooked, and served 16,090 meals of pork loin, BBQ beans, and canned corn. Over the next 11 days, they continued providing tens of thousands of meals, changing the menu a little each day to offer variety. One day it was BBQ pulled pork, BBQ beans, and carrots. Then it was sliced smoked turkey breasts, beans and rice, and mixed veggies. Then it was BBQ chicken, chicken patties, or chicken tenders accompanied by green beans and sweet potatoes. Recipients were completely stunned by the high quality of the meals. “My heavens, I couldn’t have had a better meal in a restaurant, and they’re cooking for thousands?” asked an exhausted David Martisek sitting amongst the rubble on his front steps with an OBR dinner. The volunteers included competition barbecue teams from Texas, Arkansas, Colorado, Kansas, Louisiana, Missouri, North Carolina, Oklahoma, Oregon, Tennessee, and Virginia. These compassionate souls heeded the email and social media call to action from OBR headquarters near Kansas City, MO, loaded their pickups, hooked up their pits, and headed to Houston. Cathy Basset, PR Director of Allen Harim Foods in Seaford, DE, responded by grabbing a driver and trucking 1,600 miles with 41,000 pounds of frozen chickens. Ole Hickory Pits provided eight front-loading, gas and wood burning barbecue pits. Others supplied cash, food, fuel, seasonings, sauces, volunteers, and more worth more than $1 million. Among them were Aporkalypse Now, B&B Charcoal, BBQ Bruce, Blue Rhino, Bone Sucking Sauce, Butterball, Cattlemen’s BBQ Sauce, Craig’s BBQ Sauce, Farmer’s Insurance, Heritage Chicken, Kingsford, Kroger, Meijer, Oregon Spice, Prairie Fresh Pork, Pigasaurus, Seaboard Farms, Smithfield, Texas Rib Rangers, That’s The BBQ, and Yeti. A typical day began at 4:30 a.m. by unloading meat that had been cooking all night in the smokers. Then they pulled, chopped, or sliced it, transferred it to aluminum pans, seasoned it, and slathered it liberally with barbecue sauce. Alongside the meats, the tireless team prepared hundreds of pans of baked beans, green beans, corn, rice, and yams, which they cooked in large steam kettles or various smaller pits. Some foods were packaged in bulk pans for portioning at their destination, and some were packed in individual serving clamshells. Around 6 a.m., they sealed the bulk pans, slid them into insulated boxes, and loaded them onto trucks or other vehicles for delivery by more than 150 churches, civic groups, shelters, and first responder organizations such as police, fire departments, Coast Guard, and the National Guard. Around 9 a.m., the next round of meat was unpacked, seasoned, and placed in the pits to cook in time to serve by 11 a.m. The OBR team took a short mid-day break to eat, but soon the next round of meat was unpacked, seasoned and put into the smokers so that supper would be ready between 4 and 6 p.m. Around 10:30 or 11 p.m., volunteers prepped another round of meat and loaded it into the pits to be cooked overnight. They continued this cycle every day for 11 days straight. Most days, the outside temperature was around 90°F with 40 to 50% humidity. Standing under the tents and beside the nine pits going full bore 24 hours a day made it even hotter and steamier. As the waters receded and the power came back in Houston, OBR took a few days to clean their equipment, restock, and deploy to Estero, FL, just south of Ft. Myers in the Germain Arena. Many of the Houston volunteers headed directly to the Sunshine State. They also flew thousands of meals a day into Key West. “Initially we airlifted meals in small personal aircraft maxing at a couple hundred meals at a time” said Hays. “We knew we had to do more. We reached out to FedEx. Within a day FedEx was there. What an amazing caring group of people who understand their role in the world and how to make it a better place by doing what they can do.” Click here for more information on OBR to donate money or bulk supplies or to volunteer. You can also reach them by email. OBR is listed in guidestar.org a directory of information on nonprofit organizations.